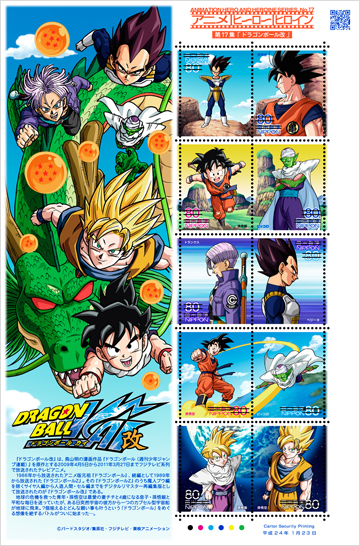 The Japanese Postal Service have announced that they will be selling stamps inspired by the Dragon Ball Kai anime series, and will be on sale from 23rd January 2012. The stamps will feature well-known characters from the series, such as Vegeta, Son Goku, Son Gohan, Piccolo and Trunks. There will be 1.5 million sheets of these stamps on sale, and each sheet will include ten 80 Yen stamps. Also, every branch of Japan Post will stamp envelopes with a special Dragon Ball Kai date stamp, featuring Son Goku. This is not the first time that Japan Post have released Anime postage stamps. The Dragon Ball Kai set are actually the 17th set released, in a series of stamps including Pokemon, Gundam and Neon Genesis Evangelion. In case you are not aware, Dragon Ball Kai is another version of the Dragon Ball Z anime that more closely follows the original Akira Toriyama Dragon Ball manga. It also included scenes from the Dragon Ball Z series that were remastered and updated, along with a re-recordeded soundtrack.